Ruthless dictator Adenoid Hynkel rules Tomania and has his eyes set on conquering nearby Osterlich; a Jewish barber who is a dead ringer for Hynkel receives temporary protection from a Tomanian Army officer whose life he saved twenty years earlier. Anti-Nazi satire released, to Chaplin's great credit, long before such sentiment became mainstream in America. Received Oscar nominations for Best Picture, Best Actor, Best Supporting Actor, Best Original Screenplay and Best Original Score. Entered 1997 into the National Film Registry. If you are curious about the work of Chaplin and want to see just one of his films to discover why he was an icon of yesterday and remains one today, this is it. 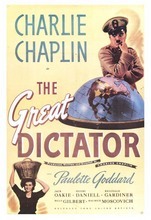 This was his first "talkie" in which he actually has speaking lines and was made during World War II, in which he plays a character that is clearly Adolf Hitler. Jack Oakie plays the role of Mussolini and between the two of them, the result is a film that holds up beautifully more than 65 years later. At the end is a beautiful speech that Chaplin gives out of character in which he calls for peace, love, tolerance and an end to all the destruction and loss of life, which has seemingly become a whirlwind spinning out of control. A timeless message indeed. What makes this film so entertaining are all the subtleties; the fabricated German phrases, idiotic gestures by Hitler and Mussolini, while showing how terrifying these years were for those who were forced to endure it. Not only is this film classic entertainment, it teaches love and kindness to all; this would be a great film to watch with elemetary age children; even if they don't understand all the subtleties of the dialogue and are yet to learn about WWII in school, they are sure to be entertained by the slapstick humor and learn about what movies were like oh-so many years ago. Watching this film is definitely time well spent.